Malty nose with a dual personality: caramelly and toasty, almost minty, hop character. On the palate a mouthfeel of deep caramel sweetness, but well met by substantial hops. Finish is long and bittersweet, with peachy overtones. I know I have had this beer before. I just don’t remember anything about it. I do know that everything I have had from Rogue has been good. As the “what they said” says, they do the opposite of what everyone else is doing. It works. They just make a good beer. Let’s get to it. Oh, and the label is supposed to be glow-in-the-dark. It’s not. Not this bottle anyway. Oh well. In the Glass: This beer has a really deep orange color to it. It also is pretty cloudy. It almost looks like there is yeast floating around the beer. There might be. I don’t know. But it looks delicious in the glass. Nose: Whoa, what a nose. What is that? I have no idea but it smells incredible. I want to say it smells like an orange, but the sweetness is what is causing that. It has some spice in there too, and while this beer has a very low ABV it might just have some heat on it. Let’s see. Flavor: The beer smells better than it tastes. I hate that too. The beer does get better as it slides across your palate, but the flavor isn’t really there until the aftertaste. You get some of those spices kicking in after you swallow, but the smell demands a better tasting beer. That’s just too bad. Mouthfeel: There are a lot of bubbles up front. We are drinking this right out of the fridge, so maybe it tastes better as it heats up. But man. I wanted this beer to be more than it is. Thinking back to the sweetness on the nose, it hits you for a second on the back middle of the tongue. But that’s it. The aftertaste starts sweet, but is quickly taken over by the spice. Aftertaste: The aftertaste is solid. The nose is amazing, the flavor pretty much stinks, and the aftertaste is at least worth talking about. I keep going back to those spices, but man. There is a ton of spice in the aftertaste. I am thinking cinnamon, and while that’s not it… it is what it reminds me of. Burnt caramel. Maybe that’s it. Anyway, the aftertaste is solid. This beer is good, and it comes from a VERY popular brewery out west. I have enjoyed almost every Rogue beer I have had. I just hate that this seems sort of bottom of the barrel. No pun intended. Beer Name – The bottle says: Nothing. The bottle doesn’t say anything at all. I have had tonight’s beer before, and I know it is a pretty good one. 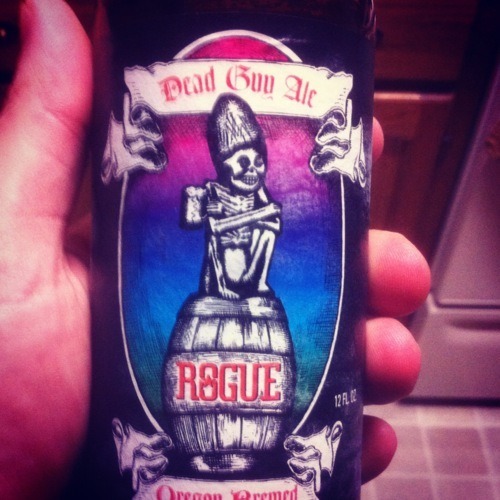 Rogue Dead Guy Ale is one of those beers that you can sometimes find around in the Midwest, primarily in bottles. It’s not too difficult to find around here. But as ales go, it’s pretty solid. When Ricky poured it out into the glass, it had a pretty decent-sized foamy head. It also looks pretty thick with some sediment floating around in the glass. (There’s probably a more official name for it than sediment, but that’s what I thought of.) It’s kind of a reddish-brown color. As far as the color, it looks pretty good. Taking a sniff, it smells kind of citrusy. That’s probably the biggest thing I get from the nose. Let’s see what it tastes like. Yep, I do like this beer. It’s pretty good as far as ales go, since I’m normally not a huge ale fan. But this is much more flavorful than I’m used to from ales. It’s definitely got a fruity citrus flavor, with just a tiny bit of hop at the very end of it, but not much. It kind of reminds me of a wheat, only darker and more flavorful. And of course, you wouldn’t find that slight hoppy taste on a wheat. Overall, it’s got a great flavor and is one I would order again. Good social beer, one I’d order out with friends. Not bad!